In order to get into the exhibition hall of the gallery “Green Sofa” that in Armenian Str. 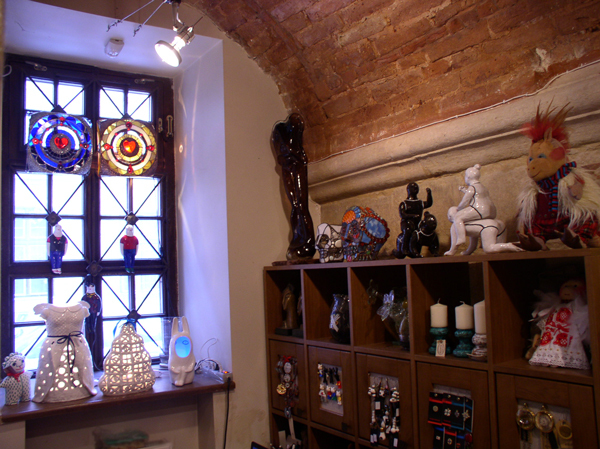 7, in Lviv, you, as in the famous film “Exit through the gift shop” have to go through a small souvenir shop. Here you will see art works by artists from Lviv and Uzhgorod. Graphics, painting, sculpture in bronze and ceramics, fine ceramics crafts, art objects from blown glass and stained glass (Tiffany), silver, brass, enamel on copper basis and stained glass jewelry made by Lviv designers, wall and table lamps, vases, candlesticks, author dolls and more. Gallery is working with the best artists and offers to buy souvenirs and original works of art. Many of them offered for sale online.